There are so many sections of planning that will go into making your dream day super special. At the start, you may have mood boards, tons of Pinterest ideas and pads where you’ve jotted down all your notes. But at some point, you are going to have to collate all those ideas into a reality and start ordering everything ahead of your big day. Right now we’re going to focus on all the wedding stationery you’ll need. So take a peek below to make sure all of these things are on your list. Once you have chosen the date and venue, or at least location, of your wedding, you’ll need to get organising those save the date cards. First up is the mammoth task of working out the guest list and then comes the wedding announcement through save the date cards. These cards should be sent about six months before the event to give everyone enough time to arrange accommodation, babysitter, or even time off work. 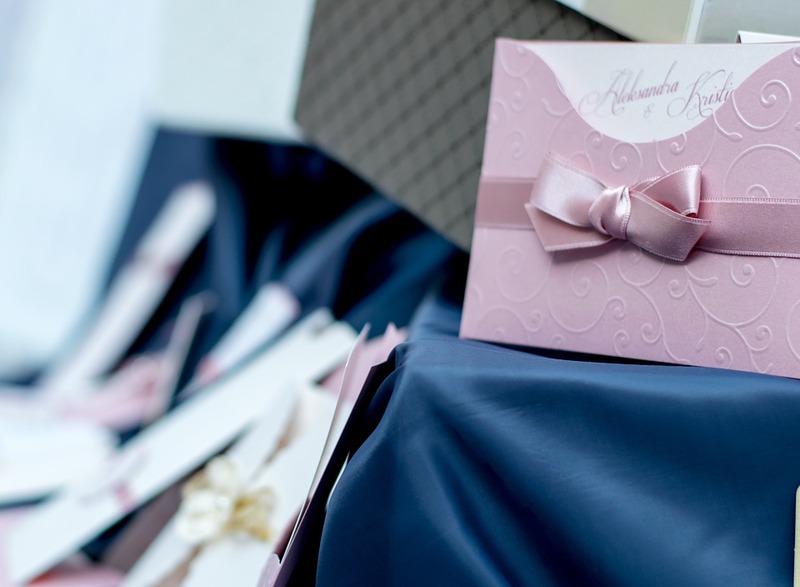 Formal wedding invitations should be sent two to three months before your big day. The invitations are the first impression guests will get of the style of your wedding, so take the time to design them with care. They may have a colour or destination theme, or perhaps be country rustic or super luxe. Take a look on Pinterest for lots of ideas on where to get started. Make sure you have also design personalised order of service wedding cards to hand out to guests as they enter the church or venue where your ceremony is taking place. Talk to the conductor of your ceremony to make sure you have all the timings correct, and be sure to add in any readings, blessings and prayers too. Make your design beautiful, as guests often use this card as a keepsake from the wedding. The dinner menus should complement your wedding table setting. They will include details of the couple’s first meal to be shared with guests. You might want sumptuous gold or silver foil if your wedding is black tie. Or perhaps pretty florals if you have a summer garden theme. You’ll also need to think about what paper you want your menus printed on, from recycled to pearlescent or matte. Place cards are super important, so everyone knows exactly where they are sitting at the reception dinner! Make these an extension of your dinner menus by using the same design. Either choose to handwrite your guest’s names or get them printed beforehand. You can get really creative with your place cards, so take a look here for some statement making ideas. And last but not least don’t forget to send out thank you cards to your guests for attending your big day. Make sure to send out your thank you notes no later than two months after you return from honeymoon. Be sincere and appreciative in your written note and thank guests by personally mentioning their gift. This shows you have taken the time to not just write the same old thing on each card. Wedding decoration is beautiful and awesome. Wedding stationary is important part of before wedding.